The U.S. Geological Survey (USGS) offers on-demand production of Landsat 8 Operational Land Imager/Thermal Infrared Sensor (OLI/TIRS) Surface Reflectance data through EarthExplorer. Surface Reflectance products provide an estimate of the surface spectral reflectance as it would be measured at ground level in the absence of atmospheric scattering or absorption. The Surface Reflectance products are generated at the Earth Resources Observation and Science (EROS) Center at a 30-meter spatial resolution. The EROS Science Processing Architecture (ESPA) on-demand interface corrects satellite images for atmospheric effects to create Level-2 data products. 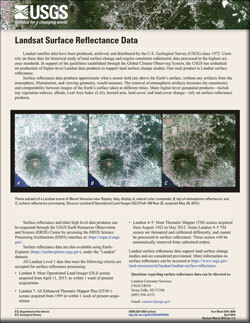 Landsat 8 Surface Reflectance data are generated from the Landsat Surface Reflectance Code (LaSRC). LaSRC makes use of the coastal aerosol band to perform aerosol inversion tests, uses auxiliary climate data from MODIS and uses a unique radiative transfer model. Additionally, LaSRC hardcodes the view zenith angle to “0”, and the solar zenith and view zenith angles are used for calculations as part of the atmospheric correction. Details about LaSRC and Landsat 8 Surface Reflectance data products can be found in the Landsat 8 Surface Reflectance Product Guide. Select scenes in EarthExplorer using the Order Scene icon in the Results tab. Go to the Item Basket (top toolbar) or View Item Basket(below result list) to review the on-demand order. Click on L8 OLI/TIRS C1 Level-2 to expand the list to view the selected scenes and verify the product type. Select Proceed to Checkout then Submit Order to initiate the processing for Surface Reflectance products through ESPA.